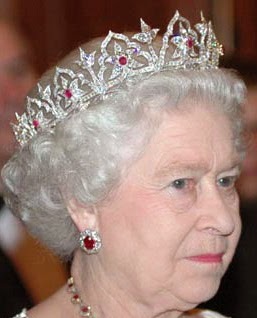 Creation: This tiara was created in 1853 by Garrard for Queen Victoria. It was designed by her husband, Prince Albert, who was inspired by the Indian jewels presented to Queen Victoria by the East India Company at the end of the Great Exhibition. 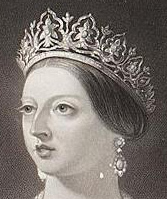 In 1858, the tiara had to be redone because some of the diamonds were lost in the Hanover settlement. 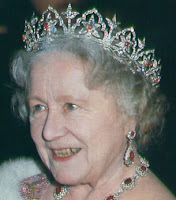 In 1902, Queen Alexandra had the tiara shortened from seventeen arches to eleven and had the opals replaced with rubies that were given to Queen Victoria in 1876 because she believed opals to be bad luck. Are there any pictures of this tiara being worn by Queen Alexandra? I wish we'd see this one more, it's beautifully proportioned and the rubies add a subtle note of interest. I wonder if it would be appropriate for Catherine to wear, or if that would violate protocol.